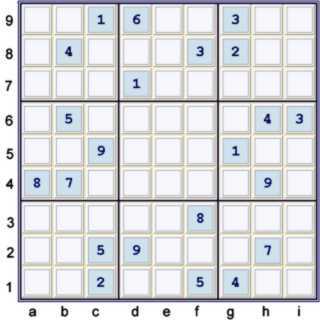 The Tough Sudoku of August 10, 2009 contains an excellent example of the power of using Quantums. This particular advanced Sudoku has the added bonus of utiliyzing a MUG, which is a type of Uniqueness deduction. These are rather advanced sudoku solving strategies, tips or tricks. 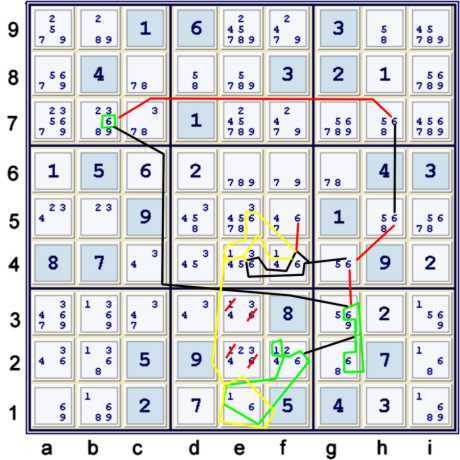 Although this page may contain a complete solution path, the main intent of this page is to illustrate the use of Quantums in solving Sudoku. For those whom do wish to view a full solution path, I have posted at the bottom of this page a group of steps sufficient to slay this puzzle. I may also post an alternative path, which is almost as interesting as this one, but does not use Uniqueness. Notice that this configuration is very similar to the one used in the August 8, 2009 puzzle. But for the (6) at f6, find the Quantum Naked Pair 16 e145.f4. Below, note that candidates (16) are almost locked into b123, e123, i123. If they were locked into those 9 cells, nothing could occur in the puzzle to avoid an eventual Unique Loop. This is not difficult to prove. It is clear, therefor, that at least one item circled in green below must be true. Circled in green is the MUG SIS. Two additional Native sis are noted, shown as black lines. Four Native weak links are noted, shown as red lines. The puzzle now quickly falls apart. Below, another path that does not use Uniqueness, but does use: a very pretty wrap around chain, or cont. AIC loop plus a Quantum SIS derived from a potential gaurdian loop 34 (Impossible pentagon) at c34, d35,e4. DigressionThis puzzle is not that difficult that it requires such advanced techniques. 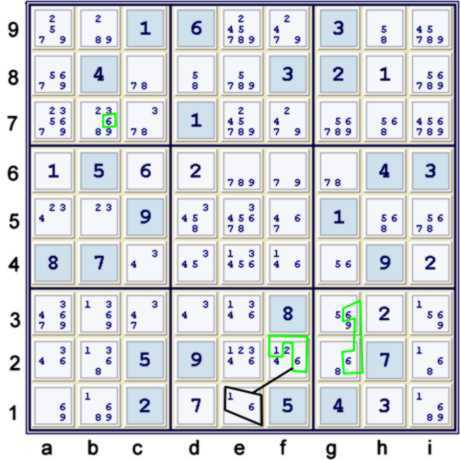 Often, at Sudoku.com.au, the tough puzzles do not rise to the difficulty level that one can reliably illustrate the more complex ideas. Thus, I have decided to occasionally slay the mice with elephant guns.